Through the support of their families, friends and communities, and their own efforts, a great many African American males do far more than survive; they thrive. However, if the presence of a sizeable and expanding group of Black male achievers suggests that structural barriers to opportunity in the United States have loosened considerably in recent decades, the large percentage of African American males who are not thriving confirms that structural forces continue to impede wide-spread progress. Large and persistent gaps in educational attainment, household income, unemployment rates and the like between African American men and white men indicate that the operations of our critical opportunity shaping institutions and structures remain profoundly color-conscious. Whereas many communities and advocates have dedicated themselves to the challenge of empowering Black boys and young men over the last several decades, efforts to systematically change the structures of opportunity within which they move have lagged behind. That must change – and it can change. With the generous support of the Open Society Institute, the Kirwan Institute has been able to further its longstanding commitment to improving Black male achievement in the United States. 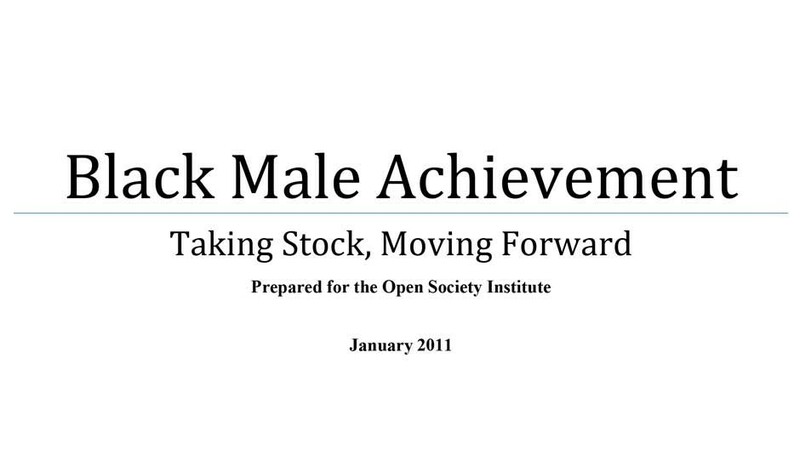 On behalf of the Campaign for Black Male Achievement we conducted research on the status of Black males in the arenas of education, employment, and family life; attended and presented our findings at convenings in the Mid-Atlantic and Midwest; and benefited greatly from one-on-one conversations with Black male advocates in the two regions. These experiences and our reflections on them have helped crystallize a set of convictions about the main thrust of the additional work needed to complement existing efforts in support of Black men and boys. Critical to this work, we believe, is a wider appreciation of the structural impediments to opportunity for Black males and a greater determination among those of us working in the field to commit our resources to transforming those structures to better serve us all.